CHICAGO (VIP NEWS) — Fare Thee Well, the Grateful Dead 50th anniversary shows that also puts a cap on one of the most remarkable live music careers in music history, wrapped Sunday night at Soldier Field in record-setting fashion. Produced by Peter Shapiro in partnership with AEG subsidiary Madison House, Fare Thee Well featured the "core four" of surviving members Bob Weir, Phil Lesh, Mickey Hart, and Bill Kreutzmann, along with Phish guitarist Trey Anastasio standing in for the late Jerry Garcia on guitar and vocals. Jeff Chimenti (keyboards), and Bruce Hornsby (piano) rounded out the band, which performed two joyous sets of music each night at Soldier Field, site of the last Grateful Dead performance with Jerry Garcia 20 years ago. The box office performance of the event was magic, as well. 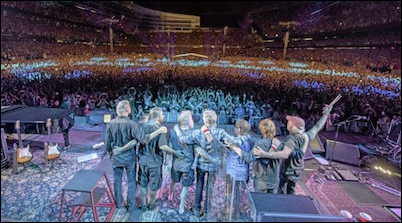 Fare Thee Well broke three consecutive post-renovation attendance records [previously held by U2 360] at Soldier Field, culminating with 71,000 paid on Sunday. While numbers are still being tabulated, the final tally was about 212,000 paid attendance. Shapiro declines to discuss financials, but on an average ticket price of about $120 (most tickets were $199.50, with some at $59, $79 and $99), that attendance would produce a box office gross of $24.5 million. With two sold out nights of about 130,000 attendance at Levi’s Stadium in Santa Clara, Calif., the previous weekend, and VIP tickets for both shows included, Fare Thee Well easily hit the $50 million gross predicted in Billboard back in April. A wide range of merchandise, overseen by Global Merchandising Services, was available throughout the Soldier Field footprint, and stands were predictably jammed all weekend. No official numbers have been released, but one source familiar with the operation told Billboard that per capita spending on the opening night topped $25 per head, which would take the merch gross close to $2 million for the night, and make a three-night merchandising take well North of $5 million. Additionally, pay-per-view numbers are still being calculated, but Shapiro says Fare Thee Well "definitely will be biggest music based PPV ever." Shapiro says his own venues, the Brooklyn Bowl in New York and the Capitol Theatre in Port Chester, N.Y., did "very well," "and I’m hearing the same from others." Brooklyn Bowl drew 800 paid Friday and Sunday night, Shapiro says, and the Capitol did over 1,000 paid each night. Outside New York, the Sinclair in Cambridge, Mass., also sold out, according to Shapiro.